The January sweater is finally off the ground. Unless of course I change my mind again. I frogged the ribbed sleeve that was also a gauge swatch. The four strands of yarn with the 15mm hook were loosey goosey and I envisaged a problem down the line, so I am now using a 10mm circular and getting a nice neat gauge of 2sts/3rows/1inch in stockinette. Complete change of plan on the sweater design. Instead of a knitted flat, ribbed, seamed turtleneck, it’s going to be knitted in the round seamlessly in stockinette. 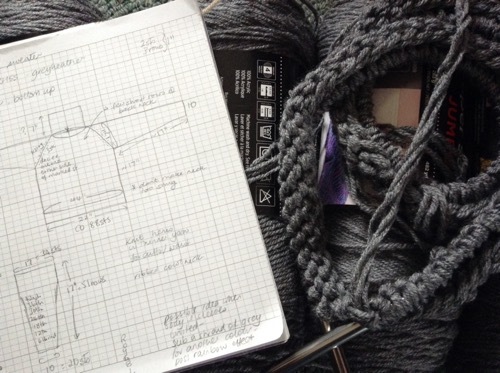 I’m using my experience of bottom up seamless sweaters from way back to work out the calculations. It’s not that hard but I tend to second guess myself a lot. So, no pattern, but as long as I get the sizing right it’ll be fine. We had a bit of melting this week. The temperature reached a balmy plus three. But it’s snowing again today. Stay warm, folks, and talk to you again soon.